This small book is a nice collection of Bhajans and Songs. Infact songs are instrumental to stir the deep layers of human heart and mind. 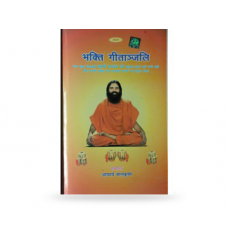 This is a very good collection and is able to vibrate the whole atmosphere in the Shivirs of Revered Swami Ramdev Ji. Another striking feature of this collection is the fit contains patriotic songs which leaves the whole atmosphere charged. Bhakti Geetanjali will be an useful book for those who love to listen or sing songs of God and Patriotism.